Short post today – just wanted to share the sandwich I had at The Smith last week. I knew I’d be having an elaborate 9-course meal later in the day, so I wanted to keep things light. I ordered the avocado sandwich with tomato, cucumbers, sprouts, goat cheese. and red onion on multigrain bread. Now you all know that I am veggie averse – but even I, the most reluctant eater of all things green found this delicious. How can you turn down some rich creamy avocado? This sandwich was deeelish and I fully intend on re-creating it at home during these warm summer months! I'm not a big veggie eater but this looks delicious! It's the combo of the good looking bread plus the amount of avocado in there. Yum. The sandwich looks great but I just can't eat avocado like that *cringes* lol How come a 2 apple verdict if you said the sandwich was delish? Something wrong with the service? The combo of avocado and cucumber sounds so good! @Elle, the sandwich was good but not the BEST I ever had, and it was the only thing I sampled on the menu. If I return and try other items, I may revise the rating. Mmm! That looks and sounds amazing! Oh I like this combo. Except goat cheese. Change that to blue cheese and i've got myself a cob sandwich sans bacon. Oh then just add bacon. That looks so delish! Anything with that many avo slices makes me drool! Looks delicious! Only a foodie like you would consider that sandwich light, though! This looks amazing. I can honestly say that sandwiches are my favorite food!! Looks great. I have never tried The Smith. 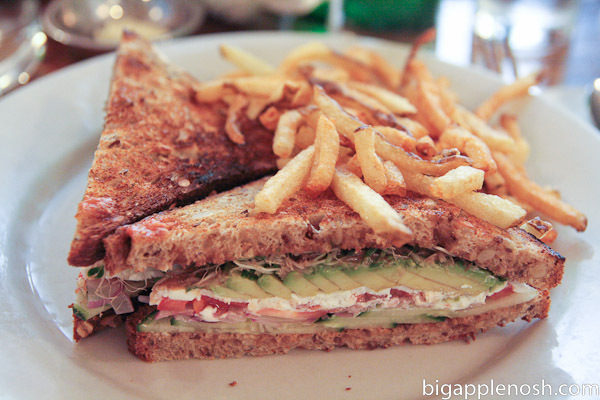 I am such a big fan of the many variations of club sandwiches you see on menus. wow they didn't skimp on the avocado–hooray!